As discussed in this question, QGIS automatically saves recently used expressions in the field calculator. But recently used expressions are deleted after a while. Sometimes I need to re-use an expression that I used a while ago, and it's no longer available. So I needed a way to store expressions for re-use in the Field Calculator at a much later time. Of course it's trivial to remember and re-enter the expression in this example. I would use this method with much more complicated expressions, such as "Population"/$area*3.58701e-8/"Population", which calculates population density (people per square mile) after first converting square feet to square miles. Just using the field name outputs the formula as a string. Is there a function that will force the Field Calculator to interpret a string as an expression? By comparison to the expressions to_real() and as_string(), I'm thinking it would be something like as_expression() or as_formula(). So the output of as_expression('$area') would be the calculated area of the polygon feature. I found the answer to my own question almost as soon as I posted it. The function I was looking for is called eval. Evaluates an expression which is passed in a string. Useful to expand dynamic parameters passed as context variables or fields. Not the answer you're looking for? Browse other questions tagged qgis field-calculator function or ask your own question. Is it possible to save frequently used expressions in QGIS? Using Elseif Conditional Statement in QGIS Field Calculator? How to save complex expressions in QGIS Field Calculator? Writing expression for field calculator in Python? 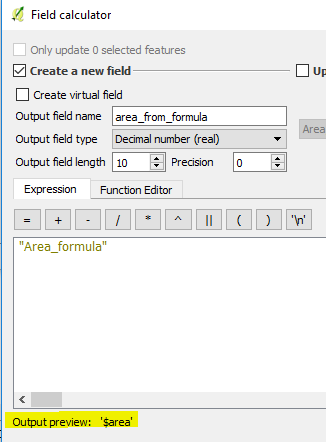 How to introduce table field parameter into field calculator formula in QGIS?